Tomas Berdych reached the final of Wimbledon in 2010 by defeating Roger Federer and Novak Djokovic. He lost to Rafael Nadal but is always a big threat in the Grand Slam events. He also reached the semi-finals of the 2010 French Open with Andy Murray being one of his victims and the 2012 US Open, defeating Federer again. He reached a career-best ranking of six in October 2010, a position he still holds going into the 2013 season. Berdych turned professional in 2002, winning two Futures events in his home country. He continued his progress in 2003, winning three further Futures titles in Britain, Hungary and Austria. He also reached one other final and six semi-finals and made his debut in the US Open, losing in round two. In 2004, Berdych won Challengers in France and Germany and played in all four Grand Slam events. In the 2004 Olympics, Berdych upset world number 1 Roger Federer before losing in the quarter-finals. He went on to reach the fourth round of the 2004 US Open and won his first title in Palermo, beating Filippo Volandri 6–3, 6–3 in the final. In 2005, Berdych reached the third round at Wimbledon, losing to Taylor Dent and was beaten in the final of Swedish Open by Rafael Nadal. At the 2005 Paris Masters, he claimed his first career ATP Masters Series title, defeating Ivan Ljubičić in the final 6–3, 6–4, 3–6, 4–6, 6–4. In 2006, he progressed to the fourth round of the French Open for the first time, losing to Roger Federer 3–6, 2–6, 3–6. He lost to the same opponent in the final of the Gerry Weber Open, played on grass and again at Wimbledon in the fourth round. He reached the same stage at the 2006 US Open, losing to James Blake. ATP singles title in Halle, defeating Marcos Baghdatis 7–5, 6–4 in the final. He also reached the quarter-finals of Wimbledon for the first time, eventually losing to Nadal 6–7, 4–6, 2–6. His improved showing in the Grand Slams continued when he reached the fourth round in the Australian Open as in 2008 but a sprained right ankle interrupted his campaign. He then reached the final of the 2008 Swedish Open before winning his only title of the year in the AIG Japan Open Tennis Championships, defeating Juan Martín del Potro in the final. In the 2009 Australian Open, Berdych looked certain to go beyond the fourth round when leading Federer by two sets to love. The Swiss star had other ideas and eventually won in five sets. Berdych got his revenge on Federer the following season, ending a losing run of seven against him with victory in three sets at the Sony Ericsson Open. He went on to reach the final before losing to Roddick 5–7, 4–6. In the 2010 French Open, Berdych put up his best performance to date in a Grand Slam when he powered to the semi-finals before losing to Robin Söderling 3–6, 6–3, 7–5, 3–6, 3–6. He reached his first Grand Slam final at Wimbledon, beating Roger Federer in four sets 6–4, 3–6, 6–1, 6–4 and Novak Djokovic 6–3, 7–6, 6–3. He was outplayed by world no. 1 Rafael Nadal in the final, losing 3–6, 5–7, 4–6. Berdych was beaten by eventual champion Novak Djokovic 1–6, 6–7, 1–6 in the fourth round of the 2011 Australian Open. At the 2011 Open de Nice Côte d'Azur, Berdych made his first semi-final of the clay season, losing to Nicolás Almagro. He then advanced confidently to the fourth round at Wimbledon before crashing in straight sets to Mardy Fish 6–7, 4–6, 4–6. A shoulder injury caused him to retire from his third round match at the 2011 US Open and he won his sixth career title by defeating Marin Čilić in the final of the China Open, 3–6, 6–4, 6–1. Berdych ended his season at the 2011 ATP World Tour Finals, winning his group to qualify for the semi-finals for the first time in his career before losing to Jo-Wilfried Tsonga 3–6, 5–7. Berdych started 2012 season with victory in the Hopman Cup for the Czech Republic with compatriot Petra Kvitová before reaching the quarter-finals of the Australian Open. He won his first ATP tournament of the year at the Open Sud de France, defeating third seed Gael Monfils, 6–2, 4–6, 6–3. He later reached the final at the Mutua Madrid Open, losing to Roger Federer in three sets. 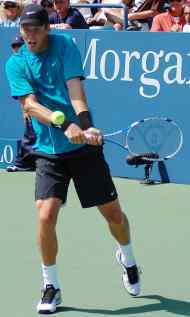 Following first round exits at both Wimbledon and the Olympics, he reached the final of the Winston-Salem Open, losing to John Isner in three sets. He then advanced beyond the fourth round for the first time in the US Open, beating Federer in the quarter-finals before losing to Andy Murray 7–5, 2–6, 1–6, 6–7. He won his second singles title of the year in Stockholm Indoor, beating Tsonga in the finals. He started 2013 by reaching the quarter-finals of the Australian Open before losing to Djokovic in four sets.